I was trying to treat this as a long training run for Hagg Lake in two weeks. I probably pushed it harder than I should have, for that. But I had fun and I’m glad I did it. A couple of us PRC Beaverton runners carpooled from our corner of the city up to Pier Park in the St. John’s area of North Portland. The park itself was notable for its majestic fir trees and for the indigenous population of disc golfers that populated it. I smelled a lot of different kinds of smoke. 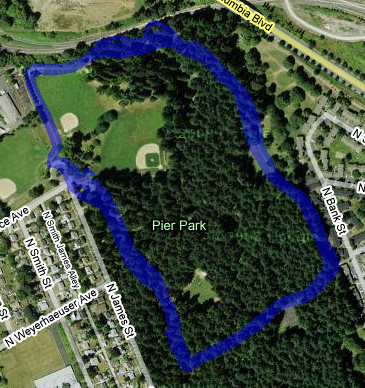 The course was a 1.01 mile loop. Having run around it a few times, I can describe the loop pretty damned exactly, but I’ll spare you the detail and just say that it had its flat sections and its hilly sections, including two very steep little uphills and two very steep little downs. Here’s an elevation profile for the first 10 laps, but in this form it’s too compressed to really get much of a feel for it. Toward the start, I was mostly worried about my left leg. It held up fine through eight miles or so, then I started noticing it more and more. After about 14 or 15 miles, it’s discomfort seemed to top out and stabilize; after 18, all the rest of the pain in my body started to take my mind off that particular area. My hydration and nutrition through the race were good; I drank a lot of water and NUUN and Heed and I ate potato chips, Fritos, meat and cheese sandwiches, peanut butter and jelly sandwiches, half a bagel, chocolate gels, gummi bears, and Fig Newtons. No stomach problems. After mile 18, things got harder as they usually do. I contemplated quitting any number of times. This was really hard and painful work for a damned training run. Crazy things were going on all up and down my left leg. My feet hurt every time I came back onto the paved portion of the loop. Eventually I started taking it mile by mile. Any other approach seemed too ambitious. After mile 24, I thought 25 would be a nice round number. After mile 25, I thought I might as well complete a marathon. During the 26th mile, I thought for a while about why I would want to run a 27th. I decided it would be because 27 miles would make for my second longest run ever. I have no idea why I did a 28th or 29th mile. Probably because people kept telling me not to stop. Peer pressure is a powerful force. I ran a 30th mile because 30 is a nice round number. Also, I didn’t actually run it. Sweetie showed up and we walked it together. That was nice. That was the only lap that I walked all of, though I walked long parts of a few others. After that, 31 miles is 50K and if I jogged it, I would break my old 50K PR by 18 minutes. Which I did: 50K in 5:42. Anything after 31 would make my longest run ever, so there was no question about not doing 32. Besides, I knew the 32nd lap would be the last one I could fit in under the time limit — but I had a good 16 minutes to get it done, if I needed. In some ways, that was the easiest lap of all. The organizers did a good job with this race. The support was great and everybody seemed to have a good time. Thanks, guys! This entry was posted on Sunday, February 8th, 2009 at 11:51 am and is filed under race reports, running. You can follow any responses to this entry through the RSS 2.0 feed. You can leave a response, or trackback from your own site. Congrats on setting a distance PR! That is something to be proud of. I love how you described your mile-by-mile rationale for not quitting – I was doing the exact same thing! I didn’t wear a GPS, so I was interested to see your elevation profile. Do you know what the gain per lap came out to be? Good luck at Hagg Lake. I don’t have the gain per lap — I haven’t had any luck teasing that data out of the software. PR’s are always awesome, and you know, that’s why we all are stuck to ultras – you know, just to next lap, to next hour, to next tree:) Good job!